Below are some highlights for a family visit to Oregon, as selected by a group of “ten something” age children who were my students. The Dorris Ranch at 220 South 2nd St, Springfield, 541/726-4335 was started in 1892. You can learn about how Mr. Dorris grew 9,200 filbert nut trees and harvested more than 50 tons of nuts each year. You can walk through 75 acres of beautiful forests and 40 acres of pasture and wetlands. You can just feel so free and happy! Fun Activity: Find out how many filbert nuts are on one tree. The historic Fifth Street Public Market at 296 East 5th Avenue in Eugene, 541/484-0383, has so many things… The most fun thing about going there is spending your money on sensible things such as bean bags animals and lovely pottery or eating delicious food at some of the 17 different restaurants and food stands. You can watch musicians, acrobats, or other people. Hult Center for the Performing Arts in Eugene, 541/687-5087 (24-hr. Event Line: DIAL-SHO), is a place where you can listen to music, watch plays and watch dances. Some events, such as “The Magic School Bus Live,” and the Dell’Arte Player’s “Journey of the Ten Moons,” are especially for families. The storytellers are also very good. Fun Activity: Take a guided tour of the Center and backstage. The Oregon Trail Exhibit at the Lane County Historical Museum in Eugene, 541/687-4239 shows a group of trails that started along the Missouri River, crossed the Great Plains, climbed through the Rocky Mountains, then continued on to Oregon, California, or Utah. There is a prairie schooner wagon, driven across the plains in 1850 by the Reed Family; a tree carved by an 8-year-old boy crossing the plains from Illinois; and “soft gold” from the Indians. You can even buy homemade soap at the gift shop. If you really liked this, go to The National Oregon Trail Interpretive Center in Baker City, 541/523-1845. When you visit this awesome museum, you feel like you were really on the Oregon Trail 150 years ago! There are many great exhibits, a very large rattlesnake, and a big ox. Kids can dress up, visit the theater, or hike on trails. 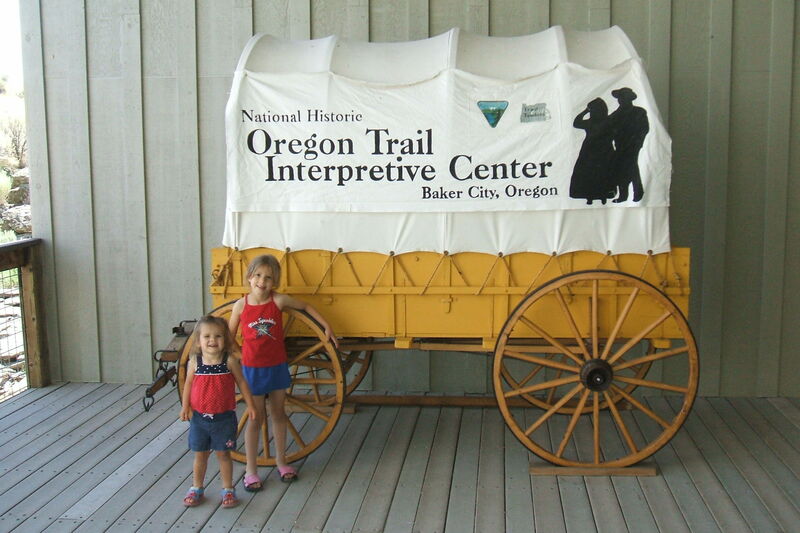 Oregon City also has the End of the Oregon Trail Interpretive Center, very interesting, too. The Eugene Saturday Market at Eighth and Oak (open April to December) is a market where people set up stands and sell hand-made, one-of-a-kind items. The food from Italy, Mexico, and Oregon is delicious. While you are eating, you can listen to jazz, watch a comedy act, or dance. The Splash! Wave Pool in Springfield, 541/747-WAVE, is a place to ride the waves, go on the waterslide, and swim laps. You can even soak in a hot tub. There is a shallow pool for small children and lots of action. I like to bump innertubes with my family and friends, and eat popcorn and pizza. The Willamette Science and Technology Center (WISTEC at 541/682-3619) has games that make you feel good about yourself when you play them. One of the most fun things is to go to the hands-on room where you can put your hands on everything. In the planetarium, you can go on a journey through the solar system and see laser rock shows. You will find cool star charts to take home at the gift shop. At The Enchanted Forest in Salem ( 503/371-4242) the Old (Woman) Lady’s Shoe is actually a slide, and you can walk around in the Witch’s Mouth. Plan to explore the mining town of Tofteville, get chills in the Haunted House, and ride the bobsleds on Ice Mountain. There is a new Log and Water Ride. The Oregon Coast Aquarium in Newport ( 541/867-3474) has frogs, sharks, sea otters, seals, an octopus, coral, starfish and exotic birds. The famous killer whale named Keiko is definitely the star of the show, and it is very exciting to watch him gracefully move around his tank! Outdoors are six acres of high cliffs and nature trails to explore. Fun Activity: Tell your family the most interesting fish fact you learned. Why? When you decide to go, call the Convention & Visitors Association of Lane County ( 800/547-5445) for more information. Janice Jensen put this article together with help from her 4th and 5th grade students.